This T-Shirt Proved White People Hate Being Called "Caucasians"
Frederick T. Joseph takes his “Caucasians” t-shirt for a stroll. 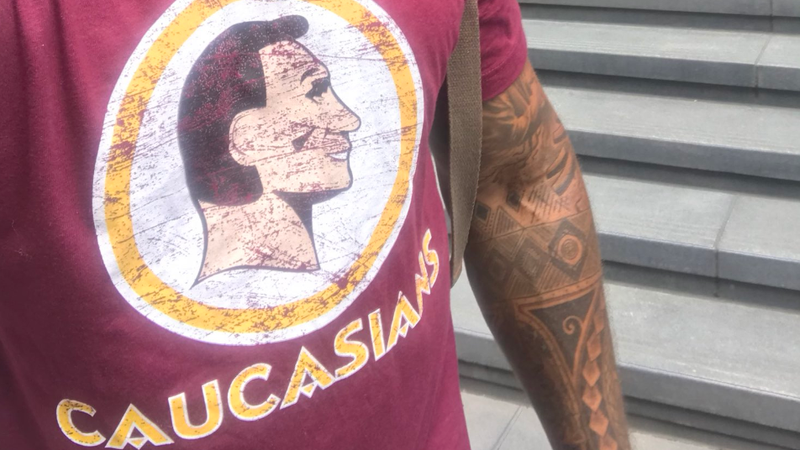 I said, “Well, what if it was the actual Redskins apparel, would that be disrespectful?” And she [says] “No, because that’s the logo.” And I’m standing there, just like, this is the dumbest thing that I’ve heard in my entire life ... I’m wearing this realistically non-problematic shirt and you’re mad because it says “Caucasian”—but think it’s perfectly fine that something with an actual racial slur is worn, so long as it’s a logo for a team? They were actually, like physically ready to come over and say something to me, and one of them stopped them. And I was like, “Wow, this is a thing.” You know, that people would take the time to feel like they have to come say something to me, seemingly about my shirt. I understood that “white fragility” is definitely a thing. The extent of it being a thing I was not prepared for, especially since the shirt in nature wasn’t derogatory nor disparaging of white people—not that you can necessarily be equally disparaging or derogatory towards them as you could people of color. But it didn’t say “crackers” or “honkeys” or anything like that; it said “Caucasians.” I’m like, aren’t y’all Caucasians? Since posting about his experiences on social media, Joseph has received a flurry of responses from offended Caucasians white folk—including threats of violence and death, calls to his workplace and outright denials that any of the encounters he detailed ever occurred. “And I’m like, we’re living in a country where people are getting the police called on them for barbecuing, but I’m lying about this? That’s funny,” he laughs. “We don’t actually work with any straight, white males,” he says, noting that a portion of the agency’s profits is donated to causes that encourage diversity and representation. Joseph is also the originator of the #BlackPantherChallenge, which earlier this year brought 75,000 kids to see Black Panther in theaters, free of charge, and raised close to $1,000,000 in the process. In fact, Joseph was recently named Humanitarian of Year at Comic-Con 2018 for his efforts. So, those who think Joseph just wanted to garner a little attention should think again; he’s already well-established in the game. He also plans to continue wearing his shirt—and will be in good company, since vendors tell him sales of the tee have escalated into the thousands since his posts went viral. Can we expect a #CaucasianTShirtChallenge next? The Glow Up tip: Want to get in on this action? You can cop “Caucasians” tees for the entire family here.